It seems like there is either too much or too little water in the Southeast Asian region. The last three months have seen heavy seasonal rain and flooding across Myanmar, Lao PDR, Cambodia, Vietnam and the Philippines, exacerbated by tropical storms Son-Tinh, Ampil, Joe, and, more recently, super typhoon Mangkhut. This has resulted in deadly consequences, including triggering dam failures in Lao PDR’s Champasak and Myanmar’s Swar creek. Indonesia has not been spared, but its problem is with too little water. Suffering from an extended dry season intensified by the drought conditions in Australia, it is estimated that five million people from 4,000 villages in 11 provinces have been facing water shortage since July. 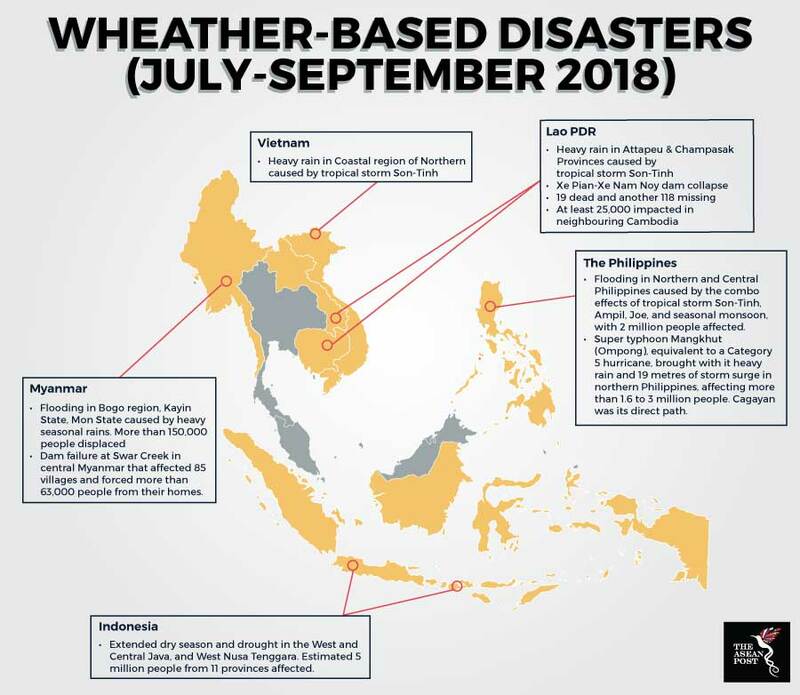 According to the National Disaster Management Agency, the worst-affected areas were Banten, West Java, Central Java, Yogyakarta, East Java, West Nusa Tenggara, East Nusa Tenggara and Lampung. Following the chain of hydrometeorological events around the region, most of which involved crucial agricultural heartlands, there is worry that it will impact food security in the areas. Swathes of paddy fields across the Mekong Delta in Lao PDR, Vietnam, Cambodia and Myanmar were inundated by the flood of water from both the heavy rain and burst dams. In some of these areas, heavy seasonal rain that came too soon and failed flood mitigation measures prevented harvest of rice crop, damaged harvest and reduced production up to 30 percent. It also added emergency costs. In the Philippines, Mangkhut made landfall at a time when the food prices were already high, with the food crops in the devastated area only 15 percent away from harvesting time. The Agriculture Secretary, Emmanuel Piñol, said that the super typhoon Mangkhut was expected to affect 1,220,000 hectares of rice and corn fields. The estimate by the Philippines’ Department of Agriculture (DA) translated the impact to 74,000 to 176,000 metric tons of damage. “On a matter of moderate basis, rice will suffer losses amounting to about PHP3.6 billion (US$66.6 million). Worst case scenario, PHP7.9 billion (US$146 million). For corn, moderate scenario our estimated damage is PHP2.7 billion (US$50 million). Our worst-case scenario is PHP3.1 billion (US$57 million),” Piñol said at a command conference in Malacañang on Thursday. Earlier this week, the Philippine’s DA also proposed the importation of an additional 132,000 tons of rice to stave off food shortages in the country’s southern region. On Indonesia’s Java island, which has been the hardest hit by the extended dry season, some farmers are saying that they have not seen rain in four months and are worried about the extent of the impact on their income. A rice farmer in Tangerang, Nurdin, west of Jakarta, said his harvest this season is a trifle compared to the harvest of the previous seasons. His seasonal harvest has reduced to only 250 kilograms of rice, which is only five percent of the usual five ton. As the crops have stopped growing and the roots have died, he has declared a failed harvest for the season. Despite destructive hydrometeorological events, Vietnam’s DA is positive that production of key food and export crops are unlikely to be significantly impacted. This is because rice farmers in the Vietnam’s Mekong Delta have completed 40 percent of the summer-autumn rice harvest before the flooding, with the rest completed before the end of August. The Indonesian agencies are not as resolute. In August, the Ministry of Trade recommended two million tons of rice import in 2018, including to maintain the commodity’s market price. However, state-owned logistics firm Bulog denied there is such a need. Its Head, Budi Waseso, said no rice importation is needed through June 2019 as the country has enough rice in stock. By nature of their geography and society, Southeast Asian countries are very vulnerable to changes in weather and climate. This season’s uncharacteristically early and strong rainy season in the northern countries and long dry season in Indonesia will have an impact on the wellbeing of their respective populations. In the face of unrelenting disaster events, information and coordination is key. Even with limited damage without significant impact on national production, rice farmers and the poor will most surely bear the brunt of this latest chain of environmental disasters.